it brings both sides of Islington together! there are so many different people from so many countries. I live around the corner! it’s why we live here! I moved away and miss it! the pound shop is so useful! everything about London is here! how friendly the shopkeepers are! my daughter, Anya, has made us love it! my boyfriend lives here and I love my boyfriend! it’s a great, great place! it has strong historical roots, and my family is from Cally Road! the diverse nature of the people. It’s the people who make it special! there is a great community feeling, lots going on, multicultural, lots of residents joining in to make it better and because it’s my home patch. I’ve just moved here and it’s amazing! I love the sense of community! I live here! It’s home. And it has a lively, friendly and very mixed population. my neighbours are lovely, and different from me! I love the Cally fest! The bags were printed in a living room and sold to raise money for daffodil bulbs to plant in the grounds of the Bemerton Estate. 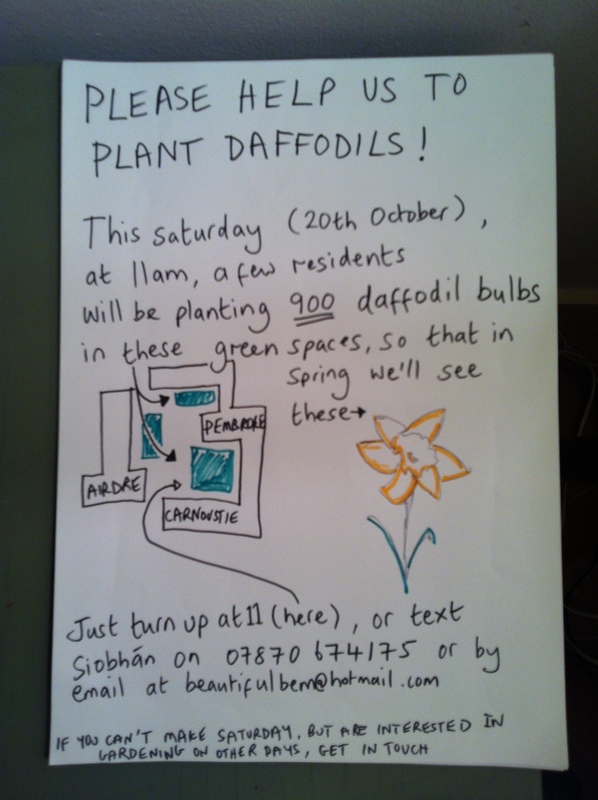 If you live on the Bem and would like to join in planting them, get in touch at BeautifulBem@hotmail.com. Or if you’re a local gardener and want to offer help or plants/cuttings to fill empty flowerbeds, get in touch! Image | This entry was posted in Community groups, Noticeboard, Wildlife and Nature and tagged Bemerton Estate, community gardening, Daffodils, Gardening, Green spaces, The Bemerton, urban gardening, volunteer. Bookmark the permalink.